I saw an awful post on Facebook recently, and I can’t stop thinking about it. And yes, I’m going to show you because I feel it’s important to the discussion to understand the context. It is VERY important to me before you read ANY further that you know I absolutely disagree with the message implied in this image. This image was shared by someone I love dearly. She is kind and loving and would never hurt anyone intentionally. It was completely “off-brand” of her to share something like this. Yes, it matches the dialogue of her political views, but it is not who she is. And I felt I needed to say something. I love you, and I hope you understand that what I’m about to say comes from a place of love. Comparing these two images serves no holy or kind purpose. You’re comparing precious religious beliefs to perceived national loyalty. Prayer is always ok. No matter who you’re praying to. No matter your religious beliefs. Our shared religious belief allow us the privilege of worshiping as we see fit, and we offer the same privilege to others. This includes – without hesitation – our wonderful Muslim brothers and sisters. They are good and kind and beautiful. I have the honor of knowing many Muslim men and women and they are wonderful, good-hearted people who are doing their best to bring goodness into the world. The second part of this image is patriotism. To compare patriotism and religion so crudely and without thought is not fair to anyone. The discussion of whether or not we should say the pledge of allegiance in our classrooms is a good debate, and one that can be held without bringing in fear, racism, and unfair comparisons. I love you. And I know you. I know you have a good heart. I know you to be one of the kindest women I’ve ever had the privilege of knowing. And I know you would never hurt anyone intentionally. 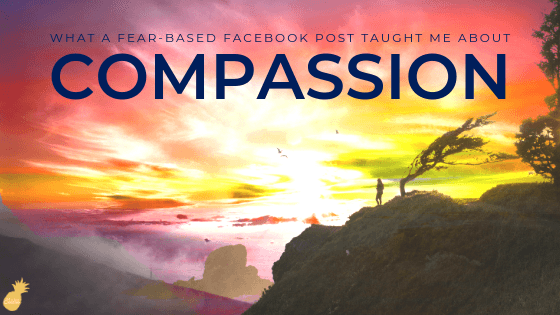 I encourage you to consider this post and whether it brings kindness and goodness into the world, or whether it is fighting a battle with fear instead of love. I edited that reply over and over again, making sure I approached the subject with kindness, but also setting boundaries and standing up for those who didn’t have a voice in that moment. Earlier in the day I read a marvelous article by Utah Jazz forward Kyle Korver. He talked about guilt versus responsibility. It’s a great article, and well worth the read. I knew as I saw my friend’s post I had a responsibility to do better. I was proud of my response. The reply I received back was – to put it lightly – shocking. My friend explained that she was concerned that there was a war against Christian belief and practice, and expressed frustration that anyone but Christians can express themselves religiously in schools. My friends, I cannot let this go. I’m white. I’m Christian. I have privilege. And I can’t sit idly by anymore. After I saw the image posted yesterday, I discussed it with my husband. While we chatted, my sweet, caring, beautiful 6 year old daughter overheard the conversation and asked a simple question – could she see the picture? I showed my daughter the image. And we proceeded to have an incredible discussion about lifting others up, even (and especially) when they don’t look, act, or believe like us. And we talked about how it was important to speak in defense of those who were picked on. She’s learning. Do you see it? She’s learning that differences are SO GOOD. My baby is only in first grade, but we’ve already been in two different schools. (#MilitaryLife) Her kindergarten school was in a liberal state and was full of diversity. White kids accounted for less than ⅓ of her class. During Ramadan, a month during which Muslims fast from sunrise to sunset, my baby’s school sent an email out to all the parents. They wanted everyone to know that a room had been set aside for meditation and prayer for those students who were observing Ramadan. The room would be open during lunch time so those kids who were fasting had a place to go. The school opened the room up to any student of any religious (or non-religious) background to go for a moment of quiet peace and meditation. The students were asked to remain silent out of respect for the other students in the room. This was discussed in classrooms throughout the month, and questions were treated with kindness and love. This is an elementary school, folks. Isn’t this wonderful that children are learning this message? And what about those Christian beliefs that are “under attack”? Like the belief to love our neighbors as ourselves? Or the belief that all people are God’s children? Or even the belief to put God first? To show faith, love, and compassion? I’d say that during the month of Ramadan, my baby girl learned every one of those values in a safe, real-world setting, in a powerful way that will change her world view forever. I know we usually talk about business stuff here, so let’s tie it in, shall we? As a business, you have a responsibility to be aware of your influence. You have an opportunity to serve those who need what you have to offer. You have a responsibility to see bigger than your lens of reality to stretch goodness even further. Business gives us cool opportunities. As entrepreneurs, this is part of our call. Hate does not combat hate. Fear does not win over fear. But love? That can conquer the world. Love allows us to be brave in our actions to defend those around us. Love allows us courage to see others that are different from us as humans deserving of love and respect. Love helps us feel safe, allowing us to spread love to others, helping THEM feel safe, too. Please be aware of what you post on social media – whether as a business or an individual. Please be aware of what you say in your establishment, to your patrons, to your family, and to your friends. Please STAND UP for those who are not as privileged as you. Please treat those you meet as humans. Because we are all humans. And we ALL deserve love and kindness and respect. We all deserve to see our value and place in the human family. No matter our religious beliefs. Religion does NOT determine the goodness, worth, or value of a person. Are you alive? Do you breathe? You have goodness. You have worth. And you are valued. Period. So, to all those reading this that believe or look or act differently than me – thank you. Thank you for sharing your love with me, even though we don’t see the world the same way. Thank you for opening up to me in a way that allows me space to be uncomfortable enough to do better. Thank you for loving me and being patient as I have only caught glimpses of my privilege. I’m not perfect. But I’m trying to be better. I promise to keep listening. Please be patient with me as I stumble and mess up. I promise to keep fighting and using my voice for you. Beautifully said. I will also keep listening and do my best to fight hate with love. Love this Roxy!! Thanks so much for writing this and sharing your love with us all. You aware a wonderful example! Great blog! I have some things to add. I’ve worked in four different schools in Utah, Southern California and Northern California. In every school, every day, the students pledged allegiance to the flag. I’ve spoken to other educators and they say the same. I don’t know where the idea comes from that it is somehow not allowed. It IS a made notion intended to invoke fear! Finally, Christianity has always been under attack. This is nothing new. And you are right. 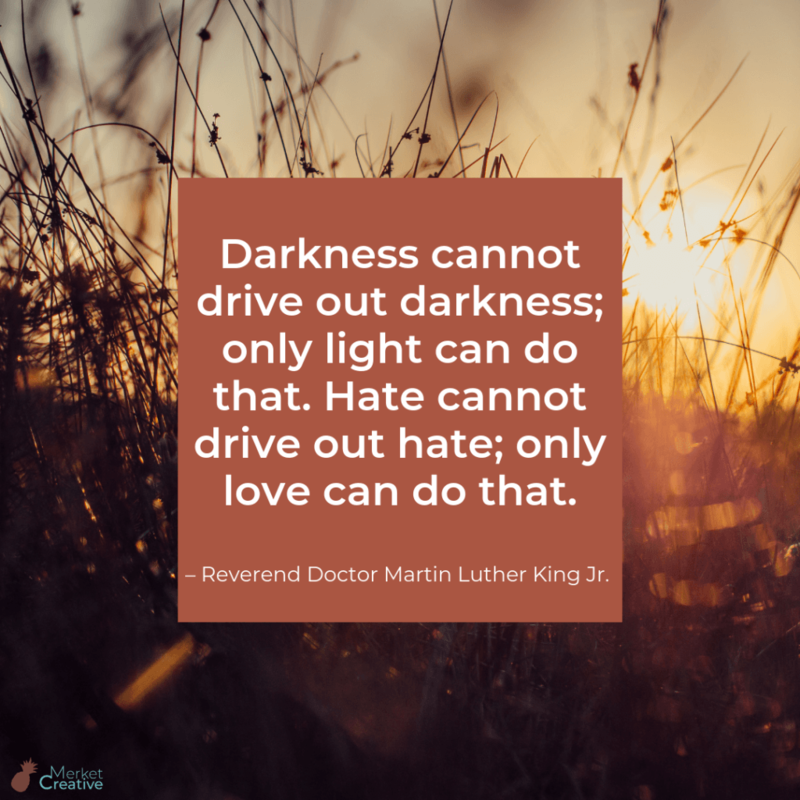 We cannot fight hate with hate!